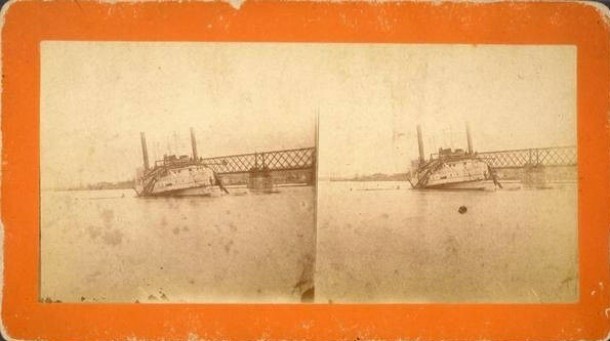 On March 29, 1876, the steamboat City of Hartford, of the New York and Hartford steamboat line, hit the Air Line Railroad Bridge on the Connecticut River at Middletown carrying away one of the 200-foot spans. The fifty passengers onboard escaped without injury but a pilot and oiler were severely injured. The damage to the bridge was estimated at $35,000 and trains would be halted until a temporary span could be constructed. Connecticut State Historic Preservation Office, and Julie Horn. Viaducts, Bridges, and Ghost Trains: Air Line Railroad Archaeological District, Colchester and East Hamption, Connecticut. Westport, CT: Historical Perspectives, 2004.